Man, just one more letter would have given us Ryujin, the Dragon God of the sea. We’ll just have to see if Rujin, troll savage of the swamp will cut it on Valhalla. The obvious comparisons to make with Rujin are the Feral Troll and Ice Troll Berserker, closest being the Feral Troll with the same life and defense. The big difference here is Rujin’s ability to regenerate 2 life per turn on a swamp map (which are pretty common), a huge advantage over the Feral Troll. Offensively they’re similar; Feral with 3 attack and Rujin with 4, both with bonuses to take them to 6. With such similarity and being better on swamp, Rujin seems like he’s looking to overshadow his Feral brethren. The Ice Troll has the same regenerative potential as Rujin, but with half the life, so opponents have a lower threshold to aim for than with Rujin. For only 15 more points Rujin has double the survivability and a wider terrain use (swamp being more common than snow/ice). This is concerning, though factors like bonding squads may even that out. Speaking of, when working with Durgeth Ravagers, Rujin is fighting for attention against Pel (and possibly Uzog, if he passes in the future). While Rujin seems to be the strongest regenerating troll, Durgeth lack consistency, and he falls into the background as Pel works better on the frontline, though Rujin still has his uses in the build (to be elaborated on in Playability). Comparing Rujin to other heroes at his point range, his ability to regenerate up to 2 wounds per turn means figures will have to consistently deal at least 3 wounds per turn in order to kill him. Against other strong heroes like Crixus, Jarek Guy, and even Pel, Rujin will usually come up the victor just with his survivability. It also means that Rujin will never be defeated by a 2 attack figure (though there aren’t many of those) and only by a 3 attack figure if it gets insane luck, which is very concerning. While the Ice Troll Berserker has similar healing ability, its lower life threshold means one good roll will finish it off, while Rujin will take three or more such rolls sequentially. Rujin is a big ol’ swamp troll from Toril. It is worth mentioning that his mini doesn’t fit in with the other trolls from Toril, though it certainly matches the big ugly swamp monster theme well, and his powers turn him into a scary swamp thing waiting for its chance to jump out and attack unsuspecting figures who wandered off (which works well for the Durgeth tie-in). Swamp Regeneration is a thematic re-skin for the power set, and Lurking Assault works well, although the shadow mention seems off in an otherwise completely swamp-themed unit, despite its origins from Othkurik. Rujin’s right-side stats are standard for a Toril troll, and his left-side stats fit well. Both of his powers are re-skins of old powers to make them new and swamp-monster themed (though Lurking Assault could have just been Lurking Ambush since they’re so similar). The combination does well in making something new that hails from something from Classic ‘Scape. Since, as other judges have mentioned, Rujin becomes a slightly worse Feral Troll when without swamp, we’ll assume this section concerns only maps with swamp for him. With a regenerative power and a power that gives him a strong first strike, Rujin shines the most in a cleanup role. If your initial forces take out your opponent’s heavy hitters, Rujin can generally coast by healing 2 wounds per turn alone. Lurking Assault is helpful when trying to hunt down figures, but unless a completely ideal situation happens (and your opponent plays into it), it will usually only see use once or twice a game (though the attacks of 6 are helpful when they come). Rujin also gets a squad to work with in the Durgeth Ravagers. With them he gets a little flexibility outside of cleanup as he can make a good mid-game skirmisher, taking out figures on the flanks while healing any wounds he takes (sometimes in conjunction with Pel, who takes the earlier activations and tanks on the frontline). As long as a player doesn’t overextend Rujin, even if the frontline Durgeth die he’ll be safe enough that in order to kill him the opponent will have to expose themselves to more Durgeth attacks, which means more Rujin activations, which means more Rujin regeneration. Then, as endgame comes and OMs go onto Rujin, he gets the constant healing that is so potent. Usually, Rujin wins in the endgame by turning it into a grind where he outlasts the other figures. Since his healing potential is so high, opponents have to be aggressive to take him out, as a few turns unmolested means your Rujin is back at full health. Even when exchanging blows consistently, opponents have to hope to at least deal the requisite 3 wounds a turn for progress, and an untimely blank is devastating as Rujin gets double healing turns in. This grind is my major gripe with Rujin. He slows down the game and has what I call the “groan factor.” While a grindy endgame isn’t necessarily terrible alone, what makes it worse is the despair an opponent feels when they don’t deal 3 wounds every turn. Even figures that can usually do good damage can panic against the troll, while low attack figures have no chance and would rather fight Q9 since at least damage done there doesn’t go away. Statistically, a singe attack of 5 or two attacks of 3 will struggle to win a grind against Rujin, and a single attack of 4 or attacks of 2 will only rarely beat him. And if the main part of your army didn’t just waste away during the fight, Rujin will usually be facing good odds. Rujin has thematic potential as a swamp (occasionally shadow?) monster for the Durgeth Ravagers to play with, but the grind he presents is awful. His best matchups are no-win situations for his opponents and most others let him drag the game on in an unfun way. Though maybe not broken in the most competitive play, I felt his flaws were too big to ignore in an SoV inductee. I vote Nay to induct Rujin into the Soldiers of Valhalla. I would like to nominate my Soontir Van design to the SoV. All friendly Mariedians who start their turn adjacent to Soontir Van may move 2 additional spaces when moving normally. If Soontir Van is attacked and at least 1 skull is rolled, roll the 20-sided die. If you roll 1-14, roll defense dice normally. If you roll a 15 or higher, ignore all damage that would be inflicted by the attack. Playability- Soontir Van’s main draw is his movement boost to Mariedians. The Mariedians are already a very mobile faction thanks to the M-43’s Guerrilla Tactics. The extra move is nonetheless still helpful, and getting the most out of that movement bonus requires some planning ahead with Guerrilla Tactics. Rather than the two movement powers making each other obsolete, they complement each other nicely and reward strategic play. I went through several variants of the stats before settling on what you see here. 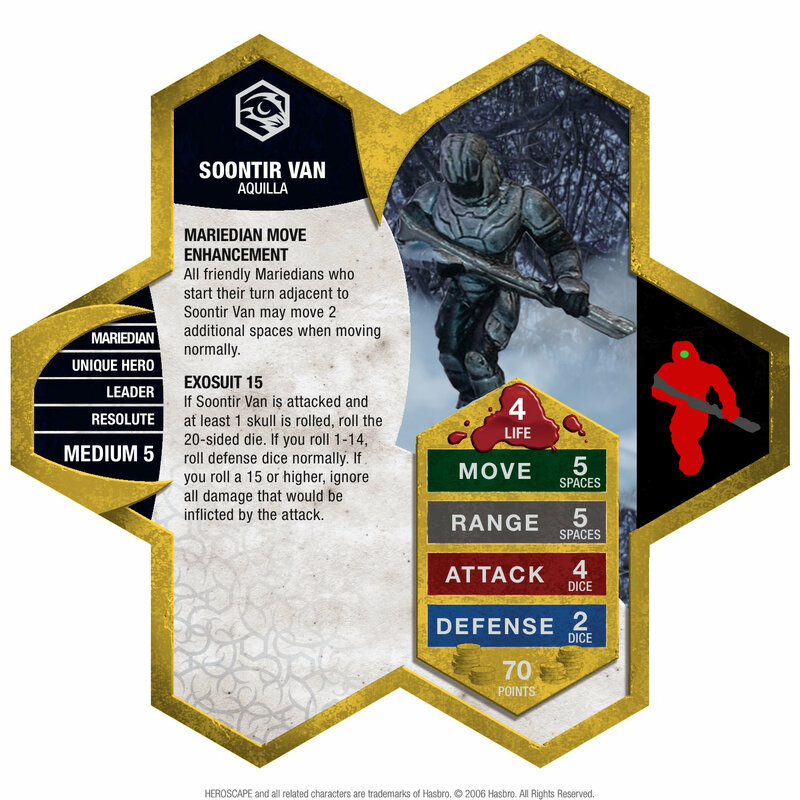 You won’t often put an Order Marker on Soontir Van, but a ranged attack of 4 means that he has his uses as a heavier hitter. Creativity- There’s nothing particularly new here. One power is reused and the other is adapted from Acolarh. Combining those two powers make for an adaptable unit that can grant a unique bonus to Mariedian armies, giving them something new. Balance- I tested him fairly extensively in various Mariedian armies. The movement boost can help a lot or not much at all, depending on your map and opponents. Soontir’s higher attack and moderate bulk (with the exosuit) give him other options as an attacker or blocker, respectively. The Mariedians are a fairly weak army and I do not believe Soontir Van makes them any stronger or weaker. As filler, Soontir is most comparable to heroes such as Arkmer or Garrett Burns. He’s okay as filler but there are more reliable options out there. I think he's priced fairly conservatively. 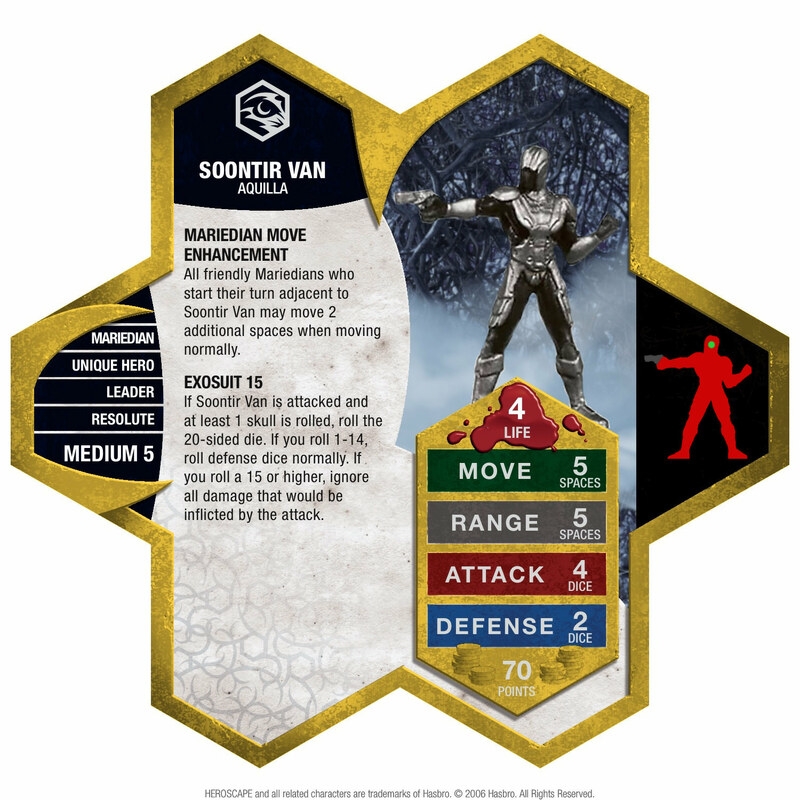 Theme- Soontir Van is a Mariedian with a similar exo-suit to what Jarek Guy has. Soontir is a natural leader among his people, inspiring them to move faster than what should be possible. Accessibility- The miniature used is a Star Wars miniature: the Sith Operative from the Knights of the Old Republic set. There are over 50 available between Troll & Toad, Game Hollow, and Miniature Market. It sells for less than $2. Last edited by Arch-vile; October 23rd, 2018 at 12:28 PM. Wow. Another nomination. That's pretty crazy. I think it's nice to have another Mariedian that looks like Jarek Guy, so that's a plus here. The short range/high attack combo is always fun. I'll be interested to see how the move boost plays out. I imagine that moving your M-43s with Guerilla Tactics so that they begin their next turn adjacent to Soontir Van will be one of the most useful plays. It'll be interesting to see two mid-price Mariedian heroes go through this process together. I'm glad they're so different, though. I vote to review Soontir Van. I was really hesitant about all the previous iterations of this design, but I really like this one; I think it's the way Exosuit + the mini ties the figure in with Jared Guy, who was one of my favorite figures to test for the SoV. However, I'm going to have to think about it a little bit more before I vote. I'm surprised to see an attack of 4 from a figure with a pistol. Maybe his phaser is set to kill. He's using a 500 Magnum instead of the standard 9mm. I like the ideas behind Soontir van. He feels overpriced(Feels more like 50pt hero) and lacking any Pizzazz, nothing stands out to me about this design. I do like the movement bonus concept though, something to build on. I'm with Kinseth - at 50, I'd like him, right now, he's feeling a bit weak. I'm surprised to see an attack of 4 from a figure with a pistol. Would you be surprised to see an attack of 4 from a figure with a bow and arrow? If yes, Kaemon Awa would like to show you something. I like Soontir Van- the movement boost is just what I’d want to boost the M-43’s, as opposed to an attack buff or silly OM management. Expsuit is a good reuse of a power that matches the miniature to a T. I do wonder about his cost, but then, faster height advantage for a Ranged Common Squad ain’t nothing. At 5 points more than another squad of M-43’s, I can definitely see him fitting into that army on paper. 4 base Attack with that pistol is out of line with every other pistol-strapped unit I can think of, and while I can’t say it breaks the unit for me, it does give pause. Not enough pause for me to automatically consider it a thematic break from the miniature, and certainly not enough to say you should bring the base attack down to 2 or 3 and add another bell and/or whistle to the card to achieve the desired attack power (Sighting, for example), but still. In the age of secondary-market PPM, c’est la vie. The unexpected short range/high attack is the only thing here that gives me pause, and that's not necessarily problematic, just unexpected. I like the reuse of Exosuit and Mariedian Move Enhancement has lots of potential when combined with the M-43s. The range/attack combo does stick out to me when compared to the similarly-armed M-43. Of course, the counterpoint would be the last B-11, who hits for 5.